She works in R&D of a cosmetics company. It was her mother who found and raised Suho after he was abandoned by his parents. She grew up with him and ends up marrying him, only to have him disappear during their honeymoon. She has been searching for her lost husband for 5 years, and she can't give up yet. Then a man called Park Dogyeong keeps bothering her. He is an emergency medicine resident. He was orphaned as an infant. He was always lonely at the thought that his parents abandoned him, but he changed after meeting Sanha. While on a honeymoon with her, he gets in a mysterious car accident. He wakes up after 5 years, but everything is different. He is the eldest grandson of Ora Group. He has to succeed to the presidency of Ora Group for his missing cousin brother, but he knows that he has neither interest nor talent for the position. When he is transferred to the US office, he goes to see Esther for the last time and dies in a car accident. He is the chief secretary of Ora Group's President Park. Since he was selected as Ora Group's scholarship student, he has been on a fast track at work. While Park Doyeong is unconscious after the accident, he gains a foothold in Ora Group, but when Dogyeong wakes up after 5 years, his plan to become the successor goes wrong. She is a curator of Ora Art Gallery. She grew up in the same orphanage as Suho, and she relied a lot on him. She gets pregnant with Park Dogyeong's child, but she is forced to break up with him by his mother Aera. When Dogyeong dies in a mysterious car accident, she switches Suho with Dogyeong. She is the director of Ora Art Gallery. When her father's business declined, she got married to Gangcheol without love. Because she wants her son Dogyeong to inherit Ora Group, she keeps a wary eye on Namjun, who is favored by her father-in-law. When her son gets in a car crash, she makes Esther, who is pregnant with his child, as her daughter-in-law, albeit disagreeably. 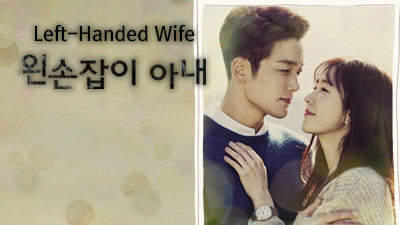 'Left-Handed Wife' Press Conference: Premiere Tonight!